Included in our recent arrival of clothing and supplies was a Wahl Hair Clipper and all of it's attachments and an electric shaver. Tom was tired by paying $29 or more for a small package of blades, often unable to find the correct blades for the shaver, especially in other countries. The Norelco, AT790 Rechargeable Cordless Tripleheader Razor was his choice of razor, a product he finds perfect for his needs. In six months it pays for itself. If it holds up for a few years he'll be happy. When I saw the Wahl electric clippers I chuckled. Guess I'll be learning how to cut his hair. Our reader many wonder, "Why doesn't he continue to get haircuts wherever we may live?" Why it is such a big deal? For more men who get their hair cut every six weeks or so they find they have a preferred barber or stylist at a location generally close to home that becomes familiar and competent with how he'd like his hair cut. Tom's hair standing up before the haircut. That's not the case in our vagabond lifestyle. As soon as he finds a barber he likes, its time to go again. Overall, he's been OK about most of the haircuts he's had in our travels. But, the inconsistency has been leaving him cold. Why he would make an assumption that I'd give him a consistently good haircut escapes me when I falter in small hand skills, mostly from being inept and secondly, from being somewhat clumsy at times. What kind of consistency can I offer him? As it goes, my nature is always to try hard and never give up. Tom knows this about me giving him confidence that eventually I'll figure it out. I may not be the best barber at first, but eventually I'll get it right. I suppose its similar to me learning how to take photos with no prior experience. Its a work in progress. Not one to read instructions, yesterday I bit the bullet and watched a few videos on how to do a buzz cut or short haircut with the electric clippers, using scissors for a final touch up. Then, I actually read the instructions included in the Wahl package. Later in the day, I trimmed the stray hairs with scissors. Overall, an improvement. Its hard to recall the last time I'd taken the time to read instructions. Perhaps, it was the last time I purchased a new car and had to look in the manual for how to change the time on the digital clock. The rest I figured out on my own, more as a result of stubbornness, less from innate skill. I suppose refusal to read instructions is more about bullheadedness and arrogance when one believes they "know it all" or at least "can figure it all out.. Arrogance, snobbery or not, I usually can figure things out. On the other hand, Tom is equally good, if not better than l am at figuring things out but, won't hesitate to look at an instruction manual. Last month neither Richard, Tom or I could figure out how to turn on the oven in Richard's house. Elaine was on the mainland and we were left trying to figure out how to avoid locking the oven while turning it on. None of us could get it figure it out. Instead, Richard used the microwave. It bugged me that I couldn't simply look at the dials and turn on the oven. Tom never gave it another thought. Later, Richard read the manual and figured out how to turn on the oven. We've had trouble with ovens and washing machines in non-English speaking countries. However, in each case we managed to get these appliances working after trying over and over with determination. Staying calm in these situations can be difficult but, over these past few years we've learned that staying cool is vital to success. Hand me an small electronic device or computer and I'm usually able to find fixes without stress. Those darned ovens and washers baffles me. In both Italy and Dubai we struggled with the ovens and washers, somehow managing to get them working. The Wahl trimmer along with lots of accessories. In time, we'll be able to toss some of these once we figure it out. Anyway, after careful perusal of how to use the clippers, we prepared the bathroom by removing the two rugs and the luggage/person scale, closing the closet door with everything we needed on hand. Tom put the barstool in the bathroom which was a little too high for my reach although better than with him sitting in a regular height chair. Next time, wherever we may be, we may be wise to use a regular chair and have him sit on something to raise him up about 6 inches. I'd expected to be a little nervous when I turned on the razor and took the first swipe. I wasn't. If I botched it, we had three weeks for it to grow back for the upcoming cruise and with a plan not to do a buzz cut, we could have that as our "ace in the hole." A buzz cut would remove any cutting errors if short enough. We used the 1" comb. Luckily, Tom had to take off his glasses so he couldn't see well enough to coach me. Leaving an inch of hair isn't as easy as one might expect using this apparatus. Snipping my own bangs and hair with sharp scissors isn't anything like using this powerful electric tool. Any skills I've had there were useless with those clippers in my hands. This electric razor has a flip up sideburn cutting blade which works very well. The amount of hair that came off his head was unreal. He didn't squirm, complain or sound worried. When I missed a spot, I made no big deal nor did I say anything when I cut too much in hopes of preventing him from worrying. When all was said and done, we cleaned up the mess and he took a shower. Once his hair dried we made an assessment. It was good, not great. I'll learn. I have no qualms about cutting his hair again in the future. As we'd assumed, throughout the remainder of the day, I'd look at him from the side to notice a few stray hairs or unevenness. On a few occasions, we went outside on the lanai where I snipped with the scissors, evening out the flaws. His patience and lack of criticism made all the difference in the world inspiring me to improve. Isn't that true with everyone we love? Inspiration comes from our own desire to excel and to please those we love. Would that all of us could have experienced this in our own upbringing and in the upbringing of our children. I cringe over the times my expectations were too high. There it is, dear readers, the home done haircut saga. I doubt we'll write about this much in the future no more that one extols the virtues of cutting an even lawn when one mows. This first experience was a momentous occasion for us both. In 19 days, we leave Kauai. In 20 days, we leave the US for the next few years. Thanks for being here with us. Have a great Monday! 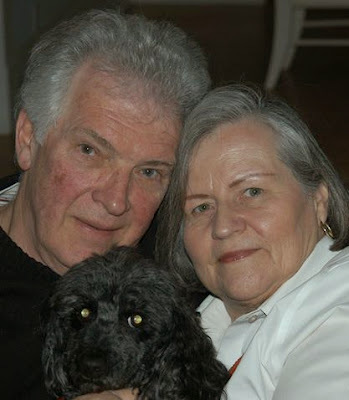 It was one year ago today that we wrote about the loss of dear friend Lane Barton who passed away the prior day, shown here with his beloved wife Peggy and their dog. For more on this story, please click here.